A 20-year veteran of the U.S. Navy, Louis McCreaven knows how to keep a tight ship, and that’s what the retired yeoman aims to do as a NorthBay Guild volunteer, signing up to spend two days a week in NorthBay Medical Center’s Emergency Department. He started volunteering for the NorthBay Guild 15 years ago, working first in cardiac rehabilitation and then, for the past 10, in the Emergency Department. 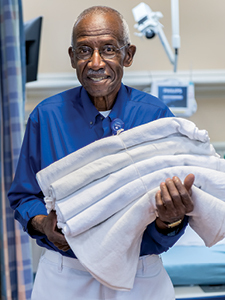 Through the years he has donated more than 2,500 hours of his time to NorthBay. In the Emergency Department, his tasks include assuring that the blanket warmer and linen shelves are stocked, that specimens are delivered to the lab in a timely manner and that specimen tubes are pre-labeled and sorted. He comforts patients and family members, trains incoming volunteers and serves on the Guild’s Leadership Council.